How to Make a Flashing LEDs Circuit for Pedestrians? Flashing Lights for Pedestrians made 4011B IC. 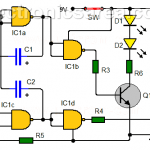 This is a simple circuit that uses high-intensity white LEDs that turn on and off continuously. It may be placed in any part of the body such as an arm.